Cut the mozzarella cheese into slices and then into thin strips. 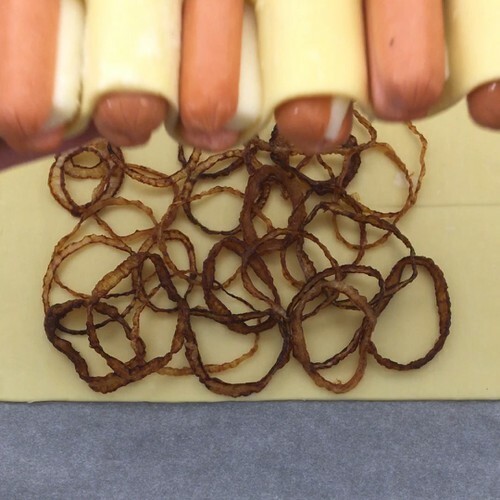 Make a cut in the hot dogs down the length, and stuff the mozzarella strips into the cuts. Cut the pastry into a rectangle the same width as the full length of the hot dogs. Cut this rectangle into 5 strips, leving the left side edge of the pastry uncut to hold it all together. Form a checkerboard of pastry and hot dog by alternating the hot dogs and strips of pastry, following the same process as the rainbow pie on p.40. Cut the onion into rings, and fry for 3-4 minutes in hot oil. Cut the second puff pastry sheet to the same width as the checkerboard, but make it slightly longer. Put the fried onion onto the second pastry sheet. Put the checkerboard pastry sheet on top of the onion and fold the edges of the bottom sheet of pastry over to make the edges. Brush the pastry with egg yolk. Bake for 15 minutes at 210°C, then decorate with mustard and ketchup and serve with some salad on the side.